Continuing our ever popular Readers Lives' series on these pages is Ipswich Town fan, Chris Mills who takes a visit to see FC Union Berlin.. IT was the best of times. It was the wurst of times. We travelled to the far, far east of the old East Berlin, to a magical place, a forest kingdom under the spell of… barbeque. Acres (or German Hektars, I should say) of sizzling grilles and everywhere the cold air warmed and suffused by the fragrant aroma of, yes: cooking meat. 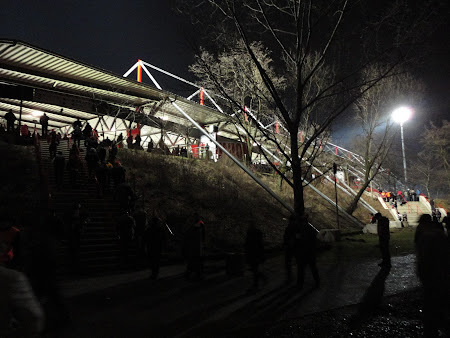 And at the centre of this beautiful, greasy sausage-fest: the Stadion An der Alten Försterei, home of FC Union Berlin. This is no sunny, goofy Australian beach barbie. 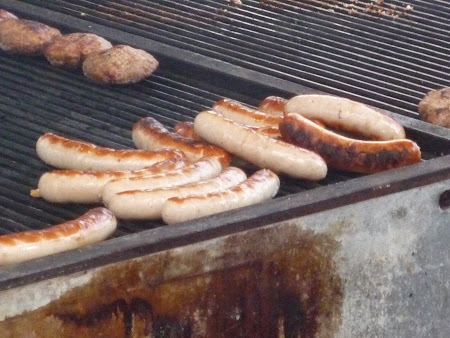 This is German meat-processing with not a hint of salad nor seafood anywhere to be seen, just German men in biker jackets and women with fantastische 80s hairdos lining up for a wurst in a bun for €1. And if you want variation, they have “Buletten” – delicious meat-lumps, also served in a naked bun, for €1.50. It’s like Communism never ended (in a good way). The delightful pork-based fragrance hits you as you step from the Köpenick S-bahn station and swarm as one with the rot/weiß (red/white) fan-base towards the Union-Tanke (the perfectly named Filling Station), a collection of über-barbies and outdoor bars on a scrubby piece of grassland nearby. Here you can eat cheap (and drink cheap) but another option is the walk through the wurst-mist past more meat cookery to the 1.FC Union Berlin klubhaus “Die Abseitsfalle” (The Offside Trap), a jolly and super-heated run-down community centre style complex where the pool table and table-fußball are both used for the putting-down of plastic beer glasses pre-match, when there’s drinking to be done. But it appears this ersatz glassware is not necessary, as my local fixer – legendary EFW Gold Member Stoffers (who recently beat Boris Becker into second place in a poll of Britain’s favourite Germans) explained. 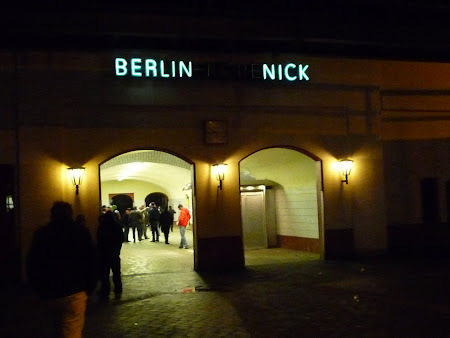 When his team 1860 München played here, the travelling fans filled the Abseitsfalle bar by 10am. It was a take-over, but when the Union fans pitched up it was all good humour and the quiet chinking of plastic beakers of Berliner Kindl and other good local lagers. This place is an homage to drinking and footy and I was slightly mesmerised (in a Twin Peaks sort of way) that the several TV screens in there seemed to perpetually show scenes also from a bar, like a strange tunnel of mirrors. There was no discernable sound from these screens – instead we enjoyed some traditional German music (Tupac Shakur). Everything about this club is cool, from its retro logo to the fact that in the days when the Wall split Berlin, being a fan of FC Union was akin to marching in the streets with a banner reading: “I heart the West!” Their arch-rival on the eastern side of the mined and watch-towered barrier was Berliner FC Dynamo, the fußball klub of the Stasi, the secret police. Mysteriously Dynamo always won the league. But this never bothered the Union fans and, indeed, they loved winding up DDR leader Erich Honecker’s goons, often to be heard chanting “Liverpool, Liiivveerrpooool” and sporting blue patches on their cut-off denim jackets in support of West Berlin’s main side Hertha BSC, ironically now their 2.Bundesliga rivals in the re-unified German capital (while Dynamo languish in the fifth-level NOFV-Oberliga Nord). Less than a week before our match, Union had won a shock 1-2 victory at Hertha in front of 74,000 and many flares. 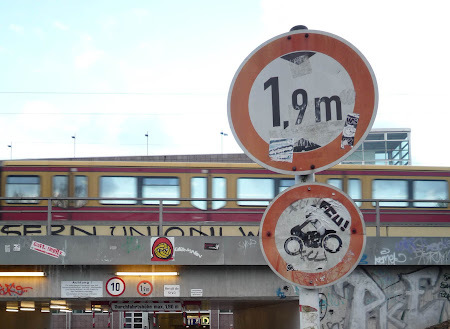 And that very night Union’s reserves beat the BFC Dynamo first team 0-1 at the Jahnstadion back in north-central Berlin – the very place where the former evil Dynamo played their big games with West Berliners peeping in over the Wall from their apartment blocks. Stoffers and I were at Union to see them take on VfL Osnabrück, from near Dortmund in Lower Saxony to the west. We operated with German precision, timing our beer intake to the millilitre and the second and then stomping through a later pitch-dark muddy forest to the 18,432-capacity ground. It was only here that some very un-Teutonic planning by the club sent us into a groundhopper anxiety spiral. The ticket sales/gate house we found ourselves outside (a building resembling an Alpine border post) had six doors but, with only 25 minutes before the 6pm kick-off, only two were open and a large crowd of surprisingly cheerful fans were trying to funnel their way into these small orifices. The mass of fans simply wasn’t moving, partly because, we later discovered, the ticket price had just gone up from €10 to €11 with no signage making this clear so everyone was fishing for that extra coin or waiting for change to be counted out. Then, at precisely 17:40, lights came on two more of the doors opened to cheers (initiated in part by Stoffers and me). But these new portals were marked “Achtung! Achtung! Season Tickets Only!” (OK, there weren’t really the Achtung!s) so while many streamed straight in, we ticket buyers were still stuck in purgatory. Eventually, Stoffers and I (both 6ft-plus and still full of currywurst from the city centre) gently forced our way around metal barriers into the line (Stoffers deftly flipping me a euro coin just in time to stop me holding things up like everyone else) while, all around, empty, inviting ways-in taunted us. There were no turnstiles; it occurred to me that, in England, this scenario may have led to a mass invasion. Our proactive queue-jumping got us in with 15 minutes to spare, but I wonder if a few fans missed the k/o. Stoffers assured me this has never happened before on his many visits to Union. Inside, the sudden feeling of space was liberating; there is a large, fenced-in area with trees and wide concrete steps up to the main stand which gives the place a kind of music festival aura, complete with its own strange, pagan statue feature a giant red hardhat surrounded by wheel barrows. This commemorates the recent rebuilding of the stadion by the fans themselves (admittedly led by fans with building companies and construction skills, but apparently regular Joes would show up just to labour). Makes “Dodgeeeee keeeephaaaaaah!” sound a little infantile. The full club anthem was even more remarkable, starting as one of the coolest sounds I’ve ever heard over a stadium PA with some death metal, morphing into The Scorpions (for old time’s sake, I suppose) and ending with community singing of the above. I went into the game a neutral and as such was impressed by the Osnabrück dee-fence; they put a stop to all Union had and nicked a goal and then another. It was looking dire for “Eisern Union” (“Iron Union” – a chant from the team’s working-class beginnings and as Union is pronounced “Oon-ee-on” in German sounds like “Icy Onion!” to many a silly English-speaking EFW member (titter). But the Onion boys turned it around about 15 minutes into the second half and it was Osnabrück’s turn to collapse at the back. Soon it was 3-2, then 3-3 and then a penalty for Union, skilfully ballooned right in to Row Gay (“Gay” is the German word for “G”). Great match and a fair result, I would say. 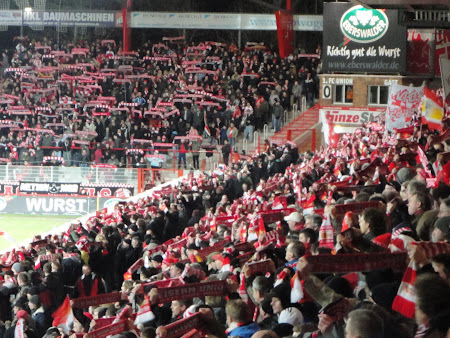 And finally, after literally days of searching, I now have my own Deutschland klub to support: 1.FC Union. The club anthem neither contains death metal nor music from The Scorpions, it's just "Rammstein" by Rammstein. But, in the end, glad, You liked it. Maybe, You and Your mates drop by a few more times. @Durchschnittstyp: You are quite right, of course - I'm afraid this was British exaggeration... and lazy journalism ;) But I can see you saw that had a great time at your klub! I have a soft spot for Union. I first encountered them when they played away to Dynamo Dresden in late 2007; mainly it was the fans' repertoire of catchy chants that hooked me. 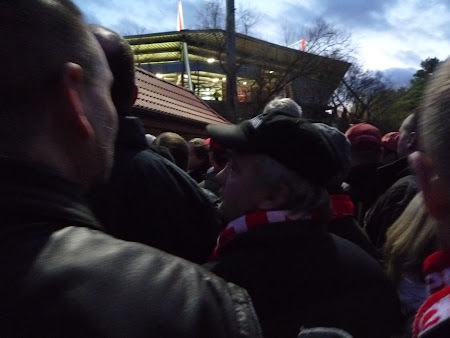 After two previous, unsuccessful attempts, I finally got to enjoy a Union game in the home end, in the Alte Försterei, last December (3:1 win v. Karlsruhe). Great fun. From a regular Jane who worked to renovate the stadium without the least bit of building skills, but with great pride - well done. Nice report. And don's worry about getting the anthem wrong - the song you liked is also pretty cool. Come again! The memories of that day will live with me forever. Since then, Chris has come back over for this match, and we've some more friends coming for the next home game with 1860. We've been looking for a German team to follow on these pages for some time - I think we might just have found our club. Talking about non-German fans' favourite German teams: St. Pauli seem to get all the attention as the 'cool' German team to follow, but I'd say Union are just as cuddly, but without all the political shtick (which I, personally, find rather irritating). Very nice blog! thnx for this from east berlin! Hey thank you for you great reports and tales of our Union-events. I really much enjoyed reading it, its quite a lot fun!!! cool report and i tell u union touched me after first visit. this club is owned by fans in many aspects. A truly fabulous stadium. Seriously impressed that the renovations were carried out by fans. The atmosphere was cracking with great choreo for the Union fans. If 'second' German teams are allowed, I'd go for Union. Hope to return someday.